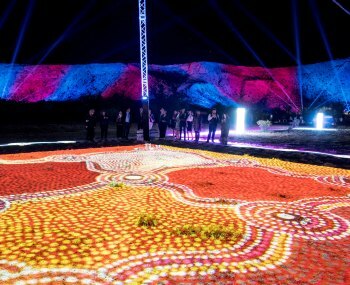 The Parrtjima Festival of Light will colour bomb around two kilometres of the MacDonnell Ranges with a light show accompanied to music for a second year. Running over 10 consecutive nights, the location (just outside of Alice Springs) attracted some criticism last year - the sound of the buses arriving every 10 minutes to deposit or pick up people from the site, for example, was said to have marred the experience. But the main concerns echoed that of zoologist and local wildlife guide, Mark Carter, who spoke of the risks to the Black-flanked Rock Wallaby, living in the MacDonnell Ranges and listed as a protected species, as well as nocturnal animals whose sensitive eyesight could have been damaged by the the high powered lasers being used at the time. We asked Mark whether there was a way of measuring the impact. "No," he says, "but any claim there wasn't injury (to fauna) is deceptive. "The lighting company operating the lasers were claimed to have run a similar event at Sydney's Taronga Zoo and because no animals were harmed there the event in Alice Springs was considered fine. However, I contacted Taronga Zoo and they told me that the light show in question was not allowed to aim any of its lighting into the animal enclosures, yet in Alice Springs high power lasers were being shone across an entire range." Given the potential risk to wildlife, and that more people would likely attend if the event were more central, it is hard to know why a site in town wasn't chosen. Though organisers this year have stated that there will be no laser lighting and that the MacDonnell Ranges will be lit up using 80 high power vehicle spotlights. Location and lighting technology aside, there were less widely published questions surrounding the event. Erwin Chlanda talked about the amount of funding for Parrtjima (suggested to be around $2 million) compared to the Alice Springs Beanie festival ($20,000) in a piece he wrote for the Alice Springs News. (Presumably, with the appointment of Rhoda Roberts this year, the funding has increased.) And that's money going to creatives outside the Northern Territory, the local talent having been overlooked. But most interesting was a question he raised about the authenticity of the art. "If it’s Indigenous canvasses you want to see," he writes, "instead of Ersatz Aboriginal culture, just down the road at the Araluen Art Centre the Desert Mob exhibition would be hard to beat, and there is no question of its authenticity." In the latest press release, we're told that Rhoda Roberts, "has worked closely with...Aboriginal artists and art centres from across the desert region to develop the festival program, with endorsement from the Parrtjima Festival Reference Group and ongoing consultation with a wider network of respected Arrernte persons." So some of these questions have been heeded, says Bob Gosford of Crikey's Northern Myth, "I reckon they've learnt some lessons from last year and covered themselves a little better this year". What was his impression of Parrtjima 1.0? "I didn't go but when I spoke to people that had their impressions were (surprisingly to me) just about all warmly positive." 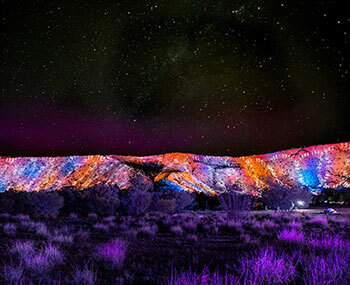 Parrtjima - A Festival in Light will run from 22 September to 1 October 2017 at Alice Springs Desert Park. Visitors are asked to register their attendance for one of four sessions held each night. A free shuttle bus is available to and from the festival, stopping at several locations around Alice Springs. The program features a number of colourful installations which can be viewed here. Artists taking part this year include those from Barkly Regional Arts, Bindi Mwerre Anthurre Artists (Adrian Jangala Robertson, Billy Tjampijinpa Kenda, Charles Jangala, Ingkamala, Jane Mervin, Kukula McDonald and Lance James), Iltja Ntjarra/Many Hands Art Centre (Gloria Pannka, Mervyn Rubuntja, Reinhold Inkamala, Vanessa Inkamala and Kathy Inkamala), Ikuntji Artists (Eunice Napanangka Jack and Gordon Butcher), and Arrernte artists (Patricia Ansell Dodds, Carol Turner and Greg McAdam).